Robert G. Veligdan, DMD (New York) - Book Appointment Online! Robert G. Veligdan DMD and his staff are pleased to offer their patients the latest in cosmetic and restorative dentistry in a comfortable and attractive Manhattan office. They strive to serve their patients in the best way by using the highest quality materials, state-of-the-art safety procedures and warm personalized service. Dr. Veligdan's expertise in general dentistry is surpassed only by his world-class artistry in cosmetic dentistry, porcelain veneers and teeth whitening. He is proud to have earned the loyalty and trust of his patients that only the experience and dedication of 35 years in the practice of dentistry can provide. No single feature of the face influences appearance more than the smile. 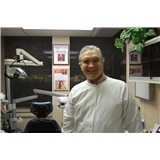 Dr. Robert Veligdan has been providing smile makeovers for an international clientele spanning three decades in New York City. Whether twice-a-year cleanings and check-ups are all you need to keep beaming or your smile requires more advanced intervention, Dr. Veligdan will provide you with the expertise and services you need for a dazzling, confident look. I visited Dr. Veligdan for a general consultation and/or years of negative dental experiences and was immediately impressed by the very welcoming and relaxing atmosphere in the office, which is rare for a dental office. The office manager Kathy is the nicest person with a greatly calming attitude. The dental assistant, although she is still a young woman, has such gentle motherly manner that you immediately feel relaxed. And of course doctor Veligdan himself is so careful and patient, even with a nervious client like myself. During the exam he constantly explained to me what he was doing, showing me x-rays on the computer screen which made me feel very comfortable. He explained treatment options, including financial options, and I never felt pressured to go for the most expensive choice like I have in the past in other dental offices. Overall, I feel grateful that I have found him. he is a rare doctor in today’s world.